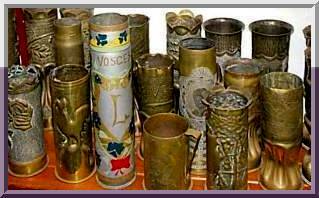 Aluminium drinking vessels (known in French as Timbales / Gobelets / Tasses / Quarts) form part of the broad definition of "Great War Trench Art", once engraved/etched/indented or scratched - being memory relic souvenirs, crafted by a multitude of peoples from the Allies and Central Powers. Manufactured drinking vessels were marked at some point in time after their making, to commemorate specific events of the war - place names, battles, names of loved ones for example. Many were used for propaganda purposes. Group of soldiers, with some having drinking cups attached to their belts. 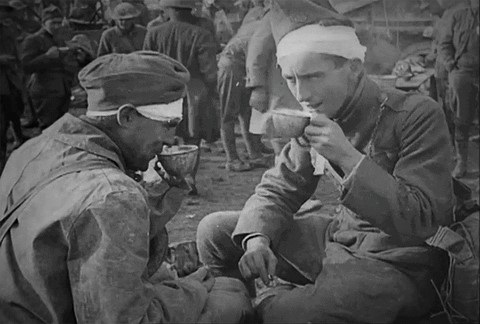 Whilst used in actual battlefield areas, these basic drinking vessels also provided sustenance for physically injured and mentally exhausted soldiers - for example, soldiers drank "Bene 'n' Hot" (Benedictine liqueur with hot water) given in Casualty Clearing Stations along the many ports in Normandy or Auxiliary Hospitals based in and around. Nurses would mix the medicinal drink with hot water to ease pain for some, or to raise the spirits amongst those on the wards. (One place in particular that gave itself up to become a hospital was the home of Benedictine D.O.M. - Palais Benedictine, Fecamp. (Hospital Auxillaire No: 34). Basic crudely scratched/indented personal equipment canteen/drinking vessels actively used in battlefield environments. Engraved personal canteen objects crafted in makeshift or permanent workshops, rest areas etc. Usually found behind combat lines, but in battlefield environments. Timbales specifically commissioned by those wanting a memory relic of the war - bearing their own name or dedicated to a Family member, usually with a date and place, made by a third party who provided these to earn income to supplement war / disablement pension, for example. Drinking vessels / feeding cups used by the French Red Cross, in larger or temporary hospitals, field hospital dressing stations then subsequently engraved. Some were objects created as a result of programmes aimed at rehabilitating the wounded through occupational therapy. Engraving small drinking vessels could be done by bedridden men, or convalescing men in workshops. Items realized industrially for propaganda or patriotic purposes - examples show coloured flags, flowers etc. and sometimes emphasising "frontier occupations" between Countries. "Production line" engraved timbale souveniers usually aimed for sale to post war battlefield tourists. These followed a set template pattern, being hand etched/engraved and decorated in repetitive styles. Some were coloured / painted (flags, faces etc.) and subsequently personalised with an owner's Name, Relative or Loved One. Hallmarked silver metal goblets were also fashioned by some jeweller engravers, commissioned to order with Names, Dates or Place names. Drinking vessels bearing the legend: "Souvenir of the Orient" often decorated with a star and crescent, emblems of the Ottoman Empire, by those who participated in the campaign of the Orient of 1915 - 1916. Objects personalised in Prisoner-of-War camps - possibly engraved by German Prisoners as favours for their captors, or Allied internees to remember their captivity or a message for a loved one. Some rarer vessels, with added adornments (a copper turning-band or ring-medal for example).